We Can Take You To The No 1 Okinawa Diving Spot Blue Cave!The Blue Cave in Okinawa ranks first among the most popular and most recommended water sports sites, where you can enjoy Okinawa diving and Okinawa snorkeling. 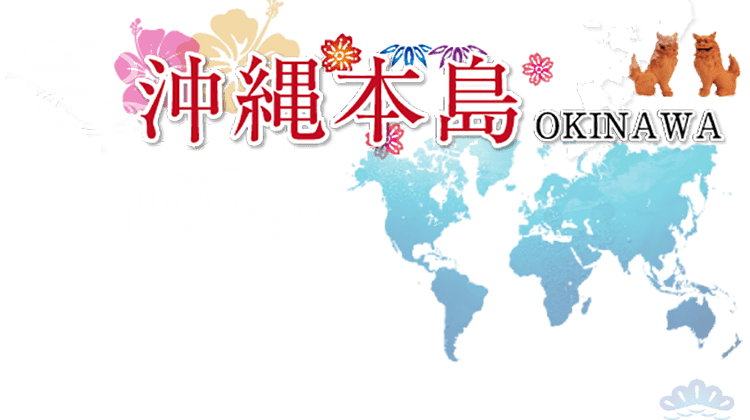 We provide you with the hospitality and service unique to Japan (O.MO.TE.NA.SHI), allowing you to experience the irresistible charm of Japanese seas; at the same time, you will feel right at home. Boasting the largest number of foreign visitors and rated as the most trustworthy, we also welcome tourists in groups! 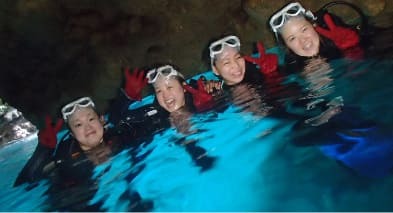 We are extremely experienced in the reception of foreign tourists.We recommend Okinawa snorkeling to beginners. Natural Blue is the only dive shop in Okinawa open to foreigners, where the instructors can speak both English and Chinese. Tourists who can’t speak Japanese can also rest assured! Your very first dive? Not to worry! Our instructors will provide assistance to help you create beautiful memories of your Okinawa trip! Welcome to Okinawa, where the climate is comfortable all year round; even the winter is warm. 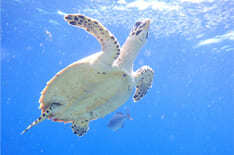 Enjoy Okinawa diving and Okinawa snorkeling here! 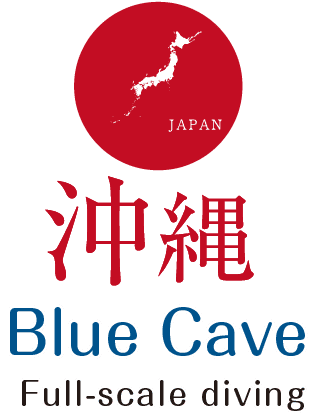 Introducing Blue Cave, the most beautiful scenic spot in Okinawa! Both children and non-swimmers can enjoy themselves here. First-time snorkelers are also welcome. Just float on the water and let the swimming ring pull you along. There is no need to swim! How relaxed! Scenery that stirs the heart laid out right before your eyes! Be captivated by Blue Cave’s dreamy azure blue light! 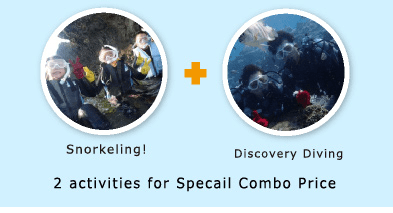 If you want to experience water sports while touring Okinawa, we recommend this easy and relaxing snorkeling activity. 1 promotional package for the experience of 2 activities. This diving trip is exclusively designed for non-swimmers and first-time divers, requiring no diving license. 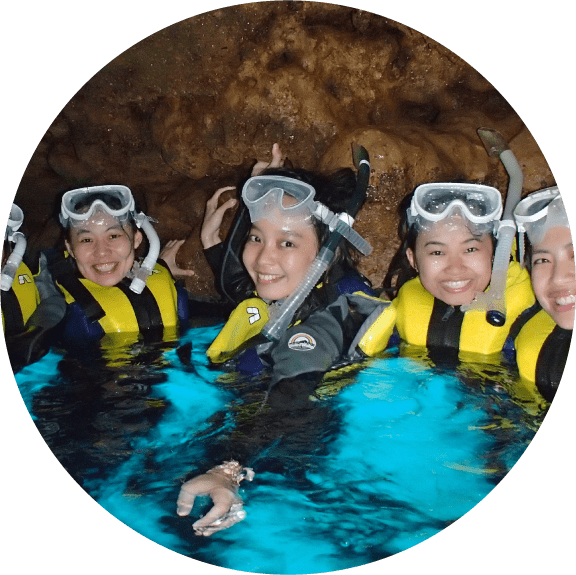 Experience snorkeling in the Blue Cave and diving experience, and enjoy the dreamy underwater world with this combo package. Easy, relaxing and safe! A delightful marine tour complete with colorful fishes and fascinating corals! 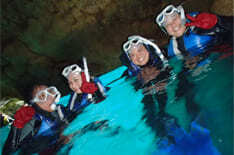 Diving Experience in Blue Cave. 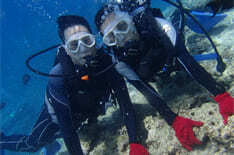 A diving trip specially designed for first-time divers. Can’t swim? Not to worry! Beginner divers, basically anyone and everyone, are welcome. No diving license is required. Easy, relaxing and safe! A delightful trip for all! The most beautiful dive location in Okinawa! Come experience diving in the Blue Cave during your trip in Okinawa! Natural Blue is the only dive shop in Okinawa open to foreigners, where communication in English is available. Rated as the most trustworthy, and boasting the largest number of foreign visitors, our instructors can attend to foreign tourists (in English or Chinese)! 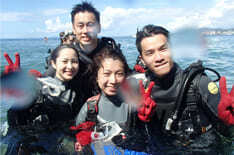 We welcome first-time divers, tourists who do not speak Japanese, as well as tourists in groups. If you want to enjoy water sports in Japan, visit the beautiful Okinawa seas which diverse marine life calls home! Surrounded by colorful corals and fishes, you will doubtless be able to have a relaxing, yet exciting one-of-a-kind experience! Whale Shark & Diving Experience. The whale shark is the largest fish in the world, measuring approximately 8 meters long. Dive with whale sharks! The most unforgettable and beautiful experience of your lifetime! A diving trip exclusively designed for certified divers! Less experienced divers are also welcome. There are captivating diving locations galore in Okinawa! 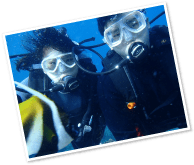 The PADI scuba diving certification course is the most popular and well known scuba certification course in the world. With this certification, you can dive in any waters around the world. It takes only 2 days to obtain the diving license. Let us head towards adventures in a brand-new world! Start your diving career at an excellent location where the sea water is warm and clear, and numerous fishes surround you. 50,000 Japanese yen+10,000 Japanese yen (before tax) for registration application fee. Applicable for 2 persons and above. MAEDA MISAKI is where the Blue Cave is located, right at the center of Okinawa. Natural Blue provides free Wi-Fi at the assembly venue of MAEDA MISAKI. Our shop has been selected as the Shop of Good Safety Practice, as designated by the Okinawa Prefectural Public Safety Commission. 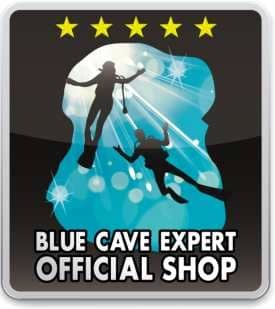 The Shop is certified as a “Blue Cave Expert Shop”. It is about 40-50 minutes by car from the airport. Drive north along National Highway No. 58 (towards Nago), turn left for cars coming from Naha and right for those from Nago at the Yamada intersection of Onna Village (in front of RENAISSANCE Hotel), then head towards Cape Zanpa for about 3 minutes along County Highway No. 6 and turn right at the blue billboard displaying “Maeda Misaki・Blue Cave” before going straight all the way to arrive at the parking lot. When setting up the car navigation system, please use the following information. Take Bus No. 20 and Bus No. 120 from Naha city to Kuraha Bus Stop, transfer to Bus No. 48, get off the bus at Maeda Bus Stop and then walk 5 minutes to reach the destination. It is approximately a 15 minutes’ walk from Kuraha Bus Stop. 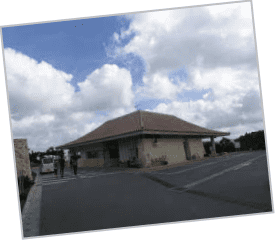 Alternatively, you can get off the bus at Ryukyu Village and take a 5-minute taxi ride to the destination. Please check with every participant for confirmation. □Participants are restricted to healthy individuals who are not presently suffering from any illness or injury. □Individuals who are required to go for regular medical follow-up visits or are on medication must produce their medical certificate. ※Individuals suffering from the following symptoms may be unable to dive. Please consult the staff before registration on whether a medical certificate is required. □ Diving is suitable for individuals aged 12-60 years old, while snorkeling is suitable for those aged 6-60 years old. 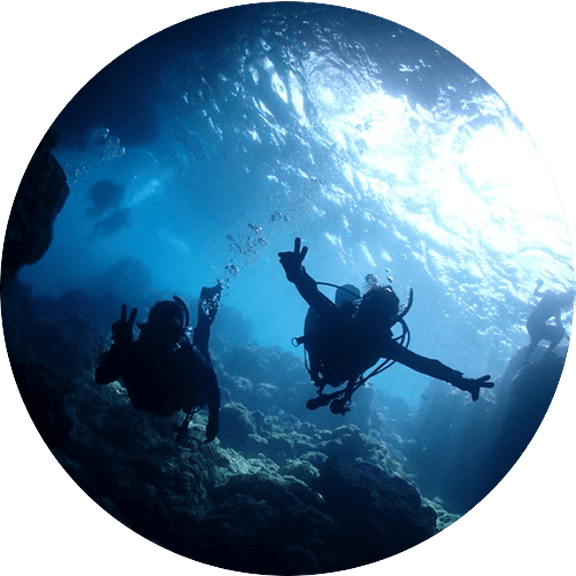 □ Individuals who regularly take medication for heart disease, lung disease, diabetes, hypertension, and those suffering from epilepsy and pneumothorax cannot engage in diving or snorkeling activities. □ Individuals who have undergone an operation or have just recovered from a serious illness within the last one month, and pregnant women cannot engage in diving or snorkeling activities. □ Please note that you may not be able to board a plane on the same day after diving. You may board a plane at least 12 hours after the first dive or at least 24 hours after two dives. □ Please do not consume alcohol. Those who suffer from a hangover or who have consumed alcohol cannot engage in snorkeling or diving activities on the same day. □ Individuals who suffer from asthma and require the regular use of inhalers and drugs to alleviate symptoms cannot engage in diving or snorkeling activities. The shop will charge a cancellation fee in case of appointment cancellation. Please note that the cancellation fee is 100% of the full amount and the appointment cannot be canceled on the day of the appointment itself. ★Please note: Appointments cannot be canceled or changed once made, so please think carefully before making an appointment. The shop will pay the insurance fee and instruction fee for each participant in advance after the appointment has been made. 100% of the full amount will be charged as the cancellation fee regardless of the reason for the cancellation. 1. Cancellation policy and change of venue due to the sea condition. 2. The trip shall not be canceled due to rain, strong wind or low temperature. 3. Please confirm your own health condition in advance. 1. Please note that our shop has a cancellation policy. Please do not cancel appointments at the last minute stating personal issues as reasons. Illnesses are considered as customers’ own health management problems; hence, we will still charge the cancellation fee. We receive overwhelming booking requests from customers but persist on giving priority to those who have already made appointments with us by fixing their schedules, dispatching instructors and preparing diving equipment in advance for them. 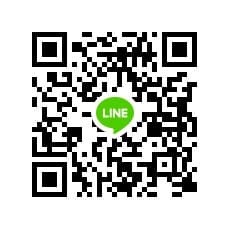 We hope that you can understand our difficulties in this matter. To protect the rights and interests of other customers, please be sure to observe the cancellation policy. Please do not use your own judgment in terms of the weather condition. We will make decisions on whether the sea condition warrants cancellation of the trip. As it is a nature experience trip, it will not be canceled merely due to the inability to visit Blue Cave. It is not just a trip to the Blue Cave that we are offering, but a nature experience trip. We will try our best to give you an experience of the beautiful nature, no matter what the circumstances. Please be sure to understand the definitions of “Nature Experience Trip” and “Nature”. The “Nature Experience Trip” takes place in nature. The sea is inevitably calm at times and choppy at others. We cannot control the changes in nature. Nevertheless, this is the true form of nature. Please keep an open mind in your interactions with Nature to experience her diversity. The Blue Cave is not the only interesting place that is worth your anticipation. 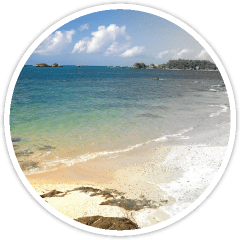 We also hope that customers can enjoy the natural scenery offered by the sea in Okinawa. Even if you fail to visit the Blue Cave, there are sure to be other fun experiences waiting for you that can only be found here in Okinawa! 2. 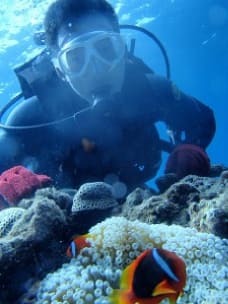 The trip will not be canceled on rainy days as rain has no effect on diving or influence on the sea condition. You will get wet while diving anyway, so there is no need to worry. The rainy scenery viewed from underwater will in fact be a precious experience. 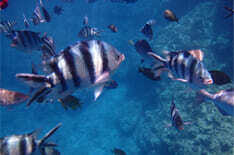 You will still be able to enjoy the sight of many fishes and corals in the beautiful underwater world despite the rain. Besides the rain, strong wind and low temperature also do not pose a problem. It is up to us, and not the customers, to decide whether to cancel a trip due to typhoons. 3. Please confirm your health condition in advance. It is essential to confirm your health condition prior to diving. Please visit the following website and complete a final check on your health condition. We only accept Japanese yen in cash. Credit cards and US dollars are not accepted. Copyright (C) 2019 【Okinawa Diving】Okinawa Blue cave Diving,Okinawa snorkeling Shop NaturalBlue All Rights Reserved.